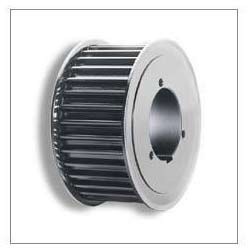 We manufacture and supply superb quality Timing Pulleys. Made from steel or aluminum, these timing pulleys have long working life strong, accurate, lightweight and durable, they possess molded high strength, manufactured in various inch as well as metric timing belt pitches. Prospect Engineering Works, incepted in the year 1965, is amongst the leading manufacturers and suppliers of this highly commendable range of Gears and Sprockets. The offered range widely praised, comprises the finest Transmission Gears, Precision Spur Gears and Sprockets Products. Manufacturing of this range is commenced using the finest raw materials and modern machines, following the norms and guidelines of the industry. This ensures the product’s sturdiness, durability, resistance to corrosion and dimensional accuracy. In addition to this, the range is made available at the best rate possible. To manage the firm’s operations, in the most efficient and effective manner, the infrastructural facility at Prospect Engineering Works has been parted into several operational units. The facility, for reasons of extending its reach and maximizing productivity, undergoes regular up-gradation. The facility has been laced with all the machinery and equipment, which facilitates the attainment of several of the firm’s predefined targets. In addition to this, our client centric behavior, have helped us in generating a huge and highly reputed client base, comprising some of the most reputed names.